May the most holy, most sacred, most adorable, most mysterious and unutterable Name of God, be praised, blessed, loved, adored and glorified in heaven, and on earth by the Sacred Heart of our Lord and Saviour Jesus Christ, in the most Holy Sacrament of the altar, and by all God's creatures. Amen. 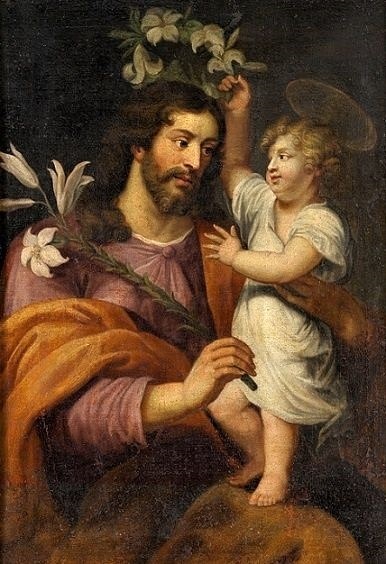 • Eternal Father, I offer Thee the adorable Face of Thy beloved Son for the honor and glory of Thy Holy Name, for the conversion of sinners and the salvation of dying souls. • Eternal Father, I ask of Thee as many souls as was the number of the drops of Blood as Thy Divine Son shed in His Passion. (She was given a vision of Hell and the multitude of souls falling in, and was invited to pray for poor sinners. Dec. 21, 1846). • Eternal Father, I offer Thee Our Savior, Jesus Christ for the expiation of my sins and for the needs of Holy Church. • Be merciful to us, O my God and reject not our prayers, when amid our afflictions, we call upon Thy Holy Name and seek with love and confidence Thine adorable Face. 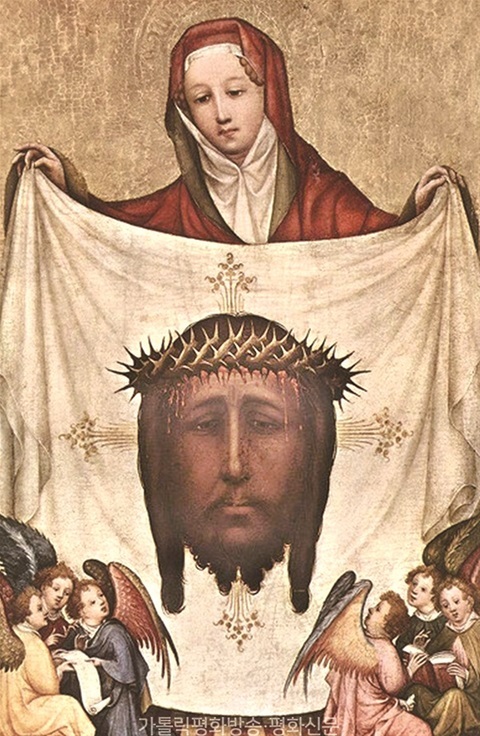 • Eternal Father, I offer Thee the Holy Face of Jesus, covered with Blood, Sweat, dust and spittle, in reparation for the crimes of communists, blasphemers and by the profaners of His Holy Name and of the Holy Day of Sunday. April 2: St. Francis of Paula Confessor, Double. April 4: St. Isidore Bishop, Confessor, and Doctor of the Church, Double. April 5: FIRST FRIDAY/St. Vincent Ferrer Confessor, Double/The Precious Blood (Friday after the IV Sunday of Lent). April 7: I Sunday of the Passion (Passion Sunday), Double of the I Class. April 11: St. Leo I Pope, Confessor, and Doctor of the Church, Double. April 12: Seven Sorrows of the Blessed Virgin Mary, Greater Double; Commemoration of the Feria. April 13: Commemoration of St. Hermenegild Martyr. April 14: II Sunday of the Passion (Sunday in Palms), Double of the I Class. April 15: Monday in the Holy Week (Jesus curses the fig tree). April 16: Tuesday in the Holy Week (Cleansing of the temple). April 17: Wednesday in the Holy Week (Judas Iscariot plans his treachery). April 20: Holy Saturday (A day of Fasting & COMPLETE Abstinence). April 21: EASTER SUNDAY, the Resurrection of Our Lord Jesus Christ, with an Octave, Double of the I Class. April 22: Easter Monday, Double. April 23: Easter Tuesday, Double. April 24: Easter Wednesday, Double. April 25: Easter Thursday, Double. April 26: Easter Friday, Double. April 27: Easter Saturday, Double. April 28: Low Sunday, Double of the I Class. April 29: St. Peter of Verona Martyr, Double. April 30: St. Catherine of Siena Virgin, Double. Admirable is the Name of God! March 3: Shrove Sunday/Quinquagesima Sunday, Double. March 4: Shrove Monday/St. Casimir, Prince of Poland, Confessor, Simple; Commemoration of St. Lucius I Pope and Martyr. March 6: ASH WEDNESDAY (Fasting & Abstinence to be observed for 40 days, except Sundays, until Holy Saturday - April 20th, 2019). March 8: The sacred Crown of Thorns (Friday after Ash Wednesday)/St. John of God Confessor, Double. March 9: St. Frances of Rome Widow, Double. March 10: I Sunday of Lent, Double of the I Class; Commemoration of The Forty Holy Martyrs. March 15: The holy Lance & the Nails of our Lord (Friday after the I Sunday of Lent)/EMBER FRIDAY. March 17: II Sunday of Lent, Double of the I Class; Commemoration of St. Patrick, Bishop and Confessor. March 18: St. Cyril Bishop of Jerusalem, Confessor, and Doctor of the Church, Double. March 22: The Holy Winding Sheet of our Lord (Friday after the II Sunday of Lent). March 24: III Sunday of Lent, Double of the I Class; Commemoration of St. Gabriel the Archangel. March 25: Annunciation of the Blessed Virgin Mary, Double of the I Class. March 29: The Five Holy Wounds (Friday after the III Sunday of Lent). March 31: IV Sunday of Lent, Double of the I Class. Glory be to thee O Co-equal Trinity, one God-head before all ages, now, and for evermore. From whom are all things; thro’ whom are all things; in whom are all things; to Him be glory for ever. The Famous Creed based on the Trinitarian Doctrine is the Athanasian Creed. It is also focused on Christology. The Latin name of the creed, “Quicunque Vult,” is taken from the opening words, "Whoever wishes". This creed explicitly states the equality of the three persons of the Trinity. 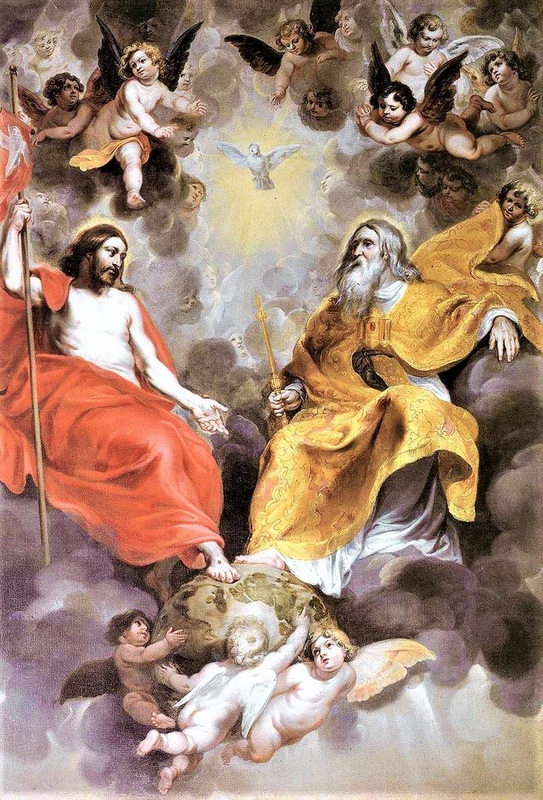 The mystery of the ever-adorable Trinity is the foundation of the Christian religion, the Master-Dogma of the Catholic Faith, and is firmly to be believed and assented to, though incomprehensible to human reason. What the Christian Church teaches us, with regard to this mystery, in a few words, is this: There is only one supreme Eternal God, Creator of heaven and earth, in three divine Persons, the Father, Son and Holy Ghost, really distinct one from the other. For the Father is not the Son, nor the Holy Ghost; nor is the Son the Father, or the Holy Ghost; nor is the Holy Ghost the Father, or the Son. The Father is from no other: The Son was born of the Father from all eternity, and is equal to him in power and majesty, of the same nature and substance: The Holy Ghost proceeds from the Father and Son from all eternity, is equal to them in power and majesty, of the same nature and substance with them. So that the Father, Son, and Holy Ghost are the One, supreme, Eternal Being; and consequently, tho’ the Father be God, the Son be God, and the Holy Ghost be God, they are but One God equally to be praised, adored, and worshiped for ever. Let us therefore this month beg Almighty God to preserve us in this Faith, and continue to teach us to submit our reason to revelation. Let us offer our prayers for those unhappy men, who, taking their weak reason for the standard of all truth, impiously give the lie to the Almighty, and refuse to believe God, when he himself teaches us (through the Church) what we are to believe concerning him. February 1: FIRST FRIDAY/St. Ignatius (of Antioch), Bishop and Martyr, Double. February 2: FIRST SATURDAY/Purification of the Blessed Virgin Mary, Double of the II Class. February 3: IV Sunday after Epiphany, Double; Commemoration of St. Blase Bishop and Martyr. February 4: St. Andrew Corsini Bishop and Confessor, Double. February 5: St. Agatha Virgin Martyr, Double. February 6: St. Titus Bishop and Confessor, Double; Commemoration of St. Dorothy Virgin Martyr. February 7: St. Romuald Abbot, Double. February 8: St. John of Matha Confessor, Double. February 9: St. Cyril Bishop of Alexandria, Confessor, and Doctor of the Church, Double; Commemoration of St. Apollonia Virgin Martyr. February 10: V Sunday after Epiphany, Double; Commemoration of St. Scholastica, Virgin. February 11: Apparition of the Blessed Virgin Mary Immaculate (at Lourdes), Greater Double. February 12: The Seven Holy Founders of the Order of Servants of the Blessed Virgin Mary Confessors, Double. February 14: Commemoration of St. Valentine Priest and Martyr. February 15: Commemoration of Ss. Faustinus and Jovita Martyrs. February 17: Septuagesima Sunday, Double. February 18: Commemoration of St. Simeon Bishop and Martyr. February 19: The Prayer of Christ (Tuesday after Septuagesima Sunday). February 22: Chair of St. Peter at Antioch, Greater Double; Commemoration of St. Paul. February 23: St. Peter Damian Confessor, Bishop, Cardinal, and Doctor of the Church, Double. February 24: Sexagesima Sunday, Double; Commemoration of St. Matthias, Apostle. February 26: Commemoration of the Passion of Christ (Tuesday after Sexagesima Sunday). February 27: St. Gabriel of Our Lady of Sorrows, Double. Ejaculatory Prayers to the Holy Family. I give you my heart, my soul, and, my life. may I die in peace in your blessed company. Taken from: A Catholic’s Vade Mecum, Edition 1851. Invocation of the Most Holy Name of JESUS. January 1: Circumcision of the Lord, Double of the II Class; Octave of the Nativity of our Lord Jesus Christ. January 2: The Most Holy Name of Jesus, Double of the II Class. January 5: FIRST SATURDAY/Commemoration of St. Telesphorus Pope and Martyr. January 6: Epiphany of the Lord, Double of the I Class. January 11: Commemoration of St. Hyginus Pope and Martyr. January 13: The Most Holy Family of Jesus, Mary, Joseph, Greater Double. January 14: St. Hilary (of Poitiers), Bishop, Confessor, and Doctor of the Church, Double; Commemoration of St. Felix (of Nola), Priest and Martyr. January 15: St. Paul, First Hermit, Confessor, Double; Commemoration of St. Maurus, Abbot. January 16: St. Marcellus I Pope and Martyr, Simple. January 17: St. Anthony (of Egypt), Abbot, Double. January 18: Chair of St. Peter Apostle at Rome, Greater Double; Commemoration of St. Paul Apostle; Commemoration of St. Prisca Virgin and Martyr. January 19: Commemoration of Ss. Marius, Martha, Audifax, and Abachum Martyrs; Commemoration of St. Canute, Martyr. January 20: II Sunday after Epiphany, Double; Commemoration of Ss. Fabian Pope and Sebastian Martyrs. January 21: St. Agnes, Roman Virgin and Martyr, Double. January 22: Ss. Vincent and Anastasius Martyrs, Simple. January 23: St. Raymund of Peñafort Confessor, Simple; Commemoration of St. Emerentiana Virgin and Martyr. January 24: St. Timothy Bishop and Martyr, Double. January 25: Conversion of St. Paul Apostle, Greater Double; Commemoration of St. Peter. January 26: St. Polycarp Bishop and Martyr, Double. January 27: III Sunday after Epiphany, Double; Commemoration of St. John Chrysostom Bishop, Confessor, and Doctor of the Church. January 28: St. Peter Nolasco Confessor, Double; Commemoration of St. Agnes Virgin and Martyr (second feast). January 29: St. Francis de Sales Bishop, Confessor, and Doctor of the Church, Double. January 30: St. Martina Virgin and Martyr, Simple. January 31: St. John Bosco Confessor, Double. Thou art all fair, O Mary, and the stain original is not in thee. Alleluia. 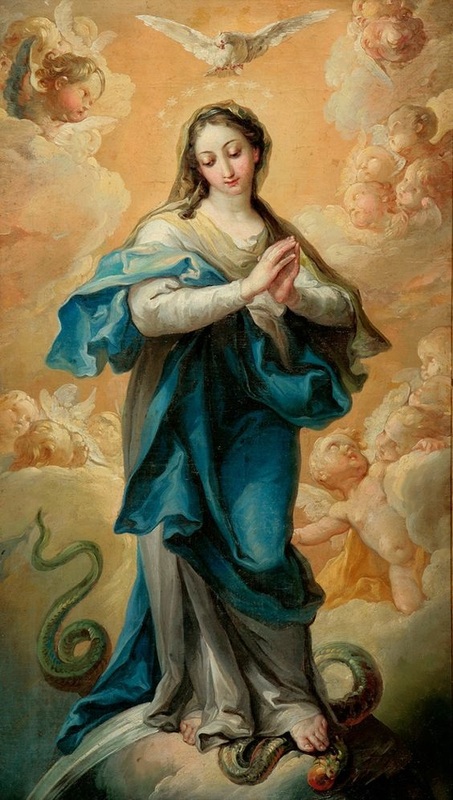 “We declare, pronounce, and define that the doctrine which holds that the most Blessed Virgin Mary, in the first instance of her conception, by a singular grace and privilege granted by Almighty God, in view of the merits of Jesus Christ, the Savior of the human race, was preserved free from all stain of original sin, is a doctrine revealed by God and therefore to be believed firmly and constantly by all the faithful.” Hence, if anyone shall dare -- which God forbid! -- to think otherwise than as has been defined by us, let him know and understand that he is condemned by his own judgment; that he has suffered shipwreck in the faith; that he has separated from the unity of the Church; and that, furthermore, by his own action he incurs the penalties established by law if he should dare to express in words or writing or by any other outward means the errors he think in his heart. Click here, to read the Apostolic Constitution by Pope Pius IX - defining the dogma of Immaculate Conception. 1. December 7, 2018: Fasting & Complete Abstinence (Eve of Immaculate Conception). 2. December 19, 2018: Fasting & Partial Abstinence (Ember Wednesday). 3. December 21, 2018: Fasting & Complete Abstinence (Ember Friday). 4. December 22, 2018: Fasting & Partial Abstinence (Ember Saturday). 5. December 24, 2018: Fasting & Complete Abstinence (Christmas Eve/Vigil). Click here, for the Church Laws of Fast and Abstinence. December 2: I Sunday of Advent, Double of the I Class; Commemoration of St. Bibiana Virgin and Martyr. December 3: St. Francis Xavier Confessor, Greater Double. December 4: St. Peter Chrysologus Bishop, Confessor, and Doctor of the Church, Double; Commemoration of St. Barbara Virgin and Martyr. December 5: Commemoration of St. Sabbas Abbot. December 6: St. Nicholas Bishop and Confessor, Double. December 7: FIRST FRIDAY/St. Ambrose Bishop, Confessor, and Doctor of the Church, Double. December 8: The Immaculate Conception of the Blessed Virgin Mary, Double of the I Class. December 9: II Sunday of Advent, Double of the I Class. December 10: Commemoration of St. Melchiades Pope and Martyr; Commemoration of Translation of the Holy House of Loretto [Regional Calendars of Spain, Belgium etc.]. December 11: Commemoration of St. Damasus I Pope and Confessor. December 13: St. Lucy Virgin and Martyr, Double. December 16: III Sunday of Advent, Double of the I Class; Commemoration of St. Eusebius Bishop and Martyr. The Commencement of the Great ‘O’ Antiphons. December 17: Mass of the Season/O Sapienta. December 18: Mass of the Season/O Adonai; Expectation of the Blessed Virgin Mary, also known as “Our Lady of ‘O’”, Greater Double [Regional Calendars of Spain, Ireland etc.]. December 19: EMBER WEDNESDAY/Mass of the Season/O Radix Jesse. December 20: Mass of the Season/O Clavis David. December 21: EMBER FRIDAY/St. Thomas Apostle, Double of the II Class/O Oriens. December 22: EMBER SATURDAY/Mass of the Season/O Rex Gentium. December 23: IV Sunday of Advent, Double of the I Class/O Emmanuel. December 24: Vigil of the Nativity of our Lord (Christmas Eve). December 25: Nativity of our Lord Jesus Christ, Double of the I Class with an Octave; Commemoration of St. Anastasia, Martyr (Second Mass). December 26: St. Stephen Protomartyr, Double of the II class; Commemoration of the Octave of the Nativity. December 27: St. John Apostle and Evangelist, Double of the II class; Commemoration of the Octave of the Nativity. December 28: The Holy Innocents, Double of the II class; Commemoration of the Octave of the Nativity. December 29: St. Thomas Becket (of Canterbury), Bishop and Martyr, Double; Commemoration of the Octave of the Nativity. December 30: Sunday within the Octave of the Nativity, Double; Commemoration of the VI day within the Octave of the Nativity. December 31: St. Sylvester I Pope and Confessor, Double; Commemoration of the Octave of the Nativity.